Jason Demuth is director of marketing for PulteGroup’s Las Vegas division. He said he found his passion for real estate development more than a decade ago and has worked in several aspects of the field. Graduating with an undergraduate degree in business administration with an emphasis on marketing in 2003 from the University of Nevada, Reno, Demuth went to work for Denver-based Intrawest Corp., one of the largest ski resort developers in the U.S. The group has offices in his hometown of Reno, where he was living at the time. “I remember I had moments a year or two out of college being in a room of architects, sales, marketing, engineers, developers looking at elevations and site maps for these new multimillion-dollar projects, and I was like how do I get to do this?” Demuth said. Demuth has had a varied career in real estate that brought him to brands such as Trump International Las Vegas and now PulteGroup. 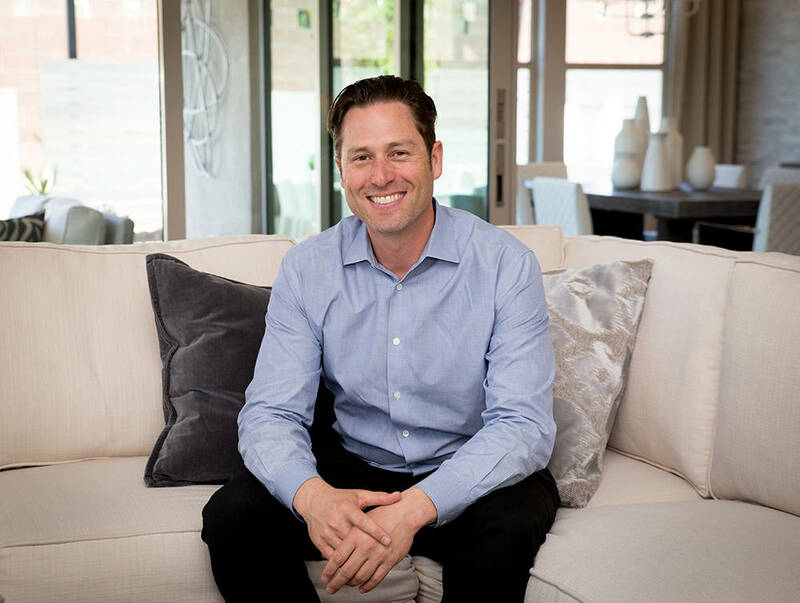 He talked to us from Pulte’s Vistara at The Cliffs, a Summerlin community, about the newest design trends and what Pulte is doing right now in the development world. Q: How many communities is Pulte Homes selling out of right now? A: We are selling out of 13 communities. That includes our Reverence project in Summerlin, so it’s technically 12. Q: How have Pulte’s sales been in recent months? A: Last year, we were one of the best-selling homebuilders per store front. … In the markets that we participate, we typically sell very well. Q: How have land constraints impacted homebuilders in the valley? A: It’s definitely impacting everyone, because there’s only so much non-Bureau of Land Management dirt left to build on right now. Unless that changes, where the government would give more to the cities. Q: What are some of the design aspects that have been growing in Las Vegas? A: There’s a big transition happening. I don’t want to say fully contemporary, but transitional, between traditional and modern. There’s a transitional movement happening right now, and also modern. Desert contemporary, I’ve heard architects say there was a time that Las Vegas built Tuscan Italian … that was the core. … In the modern era, we’re finding our own style of this desert contemporary look. It’s resonating well. It’s catching on because the buyers like it. Q: How interchangeable are floor plans on a regional basis? A: Everyone’s tastes are different. I would say that we’re not so cookie-cutter that everyone uses the same plans, because everyone uses it a little differently, depending on where they live, but there are plans that do so well that we will introduce them into some of the similar markets. Q: What is something unique about Las Vegas from a development point of view? A: I’ve been here about 10 years now. … It’s not a city that’s done. It’s a city that we’re still building, so that’s cool. Who gets to do that? Every city gets development. But we’re still building a city. We’re still early in the building of the city. Just to be able to be a part of that is cool. Q: Pulte is also incorporating green-related designs into its homes? A: In Las Vegas, Pulte Homes only builds Energy Star 3.1. Pulte is the only builder only building Energy Star 3.1. Q: Can you describe what you did at Intrawest? A: It was the front end of development. We were having input on design of what we were building. We did all of the sales and marketing pre-launch work on what we were building. For that business, we were building reservations. We had pre-sale objectives. Because a lot of it was like big, attached kind of stuff, we would pre-sell to a certain extent, and then they would build the project. It was vacation homeowners, so second homeowners. That was my background before coming here — vacation homes. Q: You went to work for Trump International Las Vegas just after the economy crashed? A: By 2010, there wasn’t much going on, I went to work for Trump Tower in Las Vegas. They had the high-rise. It had pre-sold 100 percent. When it came to the closing part, it was during the downturn, so they closed just a portion — a surprising portion of the building, but just a portion. Q: What did you learn, as far as from a real estate aspect, while working at Trump Tower? A: I understood the condo-hotel, because that’s what I did a lot of, and resorts. Condo-hotel, the reason you have it, is it’s a second home where you own it 100 percent. … I understood that part of the business. I learned a lot about hospitality, because being there full time, dedicated to that one tower, I got to touch everything. I got to work on retail, dining. I was there for about 4½ years. Q: How is working at Pulte different than some of your other experiences in real estate? A: That’s the really cool thing that I’ve been able to do, in my opinion, in my career, is I’ve been able to work in different parts of the same business. Initially, it was resort-focused, with pure development. And then it was resort-focused but more hospitality. Now, it’s primary. Now, I’m building primary homes in developments. It’s like I’ve been able to really see all the pieces of the real estate business. Q: What are some things you enjoy doing in Las Vegas? A: I just did some snowboarding, recently. I’ve been skiing my whole life. We go up to Lee Canyon a lot. We live over on the west side in Summerlin, so we live right off Charleston — right there, so we go up to Red Rock all the time. We go camping as much as we can — Mount Charleston and Valley of Fire. We try to, as much as we can, get out.